Gabriella Povero si è laureata in Ingegneria Elettronica presso il Politecnico di Torino. Ha lavorato presso il COREP (Consorzio per la Ricerca e la Formazione Permanente), un consorzio operante all’interno del Politecnico di Torino, dove ha contribuito allo sviluppo di TOPSIM, un simulatore per sistemi di telecomunicazioni progettato e realizzato dal gruppo Telecomunicazioni del Dipartimento di Elettronica del Politecnico di Torino grazie al contributo dell’Agenzia Spaziale Europea (ESA). Ha, inoltre, collaborato con il Dipartimento di Elettronica del Politecnico di Torino in contratti di ricerca nel campo delle comunicazioni satellitari. Dal 2003 lavora presso l’Istituto Superiore Mario Boella, dove è responsabile dell’Unità International Cooperation on GNSS dell’Area di Ricerca sulle Tecnologie di Navigazione Satellitare. È il rappresentante di ISMB nel Comitato di Coordinamento del Master on Navigation and Related Applications del Politecnico di Torino. Dal 1997 è professore a contratto del Politecnico per corsi di Teoria dei Segnali, Comunicazioni Elettriche e Sistemi di Navigazione Satellitare. È attiva anche nel campo della cooperazione internazionale, con particolare interesse verso il Sud-Est asiatico e ha coordinato progetti in questo settore. Rappresenta ISMB nel Comitato di Gestione del Centro NAVIS, un centro per la collaborazione internazionale sulla navigazione satellitare con base presso la Hanoi University of Science and Technology. Gabriella Povero received the Laurea in Ingegneria Elettronica from Politecnico di Torino. Soon after she joined COREP, a research consortium operating inside Politecnico di Torino. In this period she contributed to the development of TOPSIM, a software package for the simulation of telecommunication systems designed and implemented by the Telecommunication Group of Politecnico di Torino under contracts from the European Space Agency. Furthermore, she cooperated with the Telecommunication Group on research contracts in the field of satellite communications. 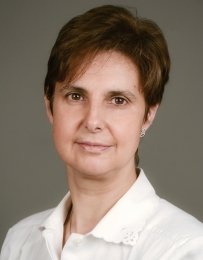 In 2003 she joined Istituto Superiore Mario Boella, where she is responsible of the International Cooperation on GNSS Unit of the Navigation Technologies Research Area. She is the ISMB representative within the Coordination Committee of the Master on Navigation and Related Applications of Politecnico di Torino. Since 1997 she has been contract professor of Politecnico di Torino for courses on "Signal Theory", "Radio Communications", and "Satellite Navigation Systems". Her activities are also focused on international cooperation with South East Asia. She has been the coordinator of some projects in this field. She is ISMB representative in the Board of Supporting Institutions of NAVIS, a Collaboration on Satellite Navigation Technologies located in Hanoi in the premises of the Hanoi University of Science and Technology. Vannucchi, M., T. Ta Hai, and G. Povero, "Growing NAVIS - EU-SEA Cooperation Action in the Field of GNSS", International Symposium on Global Navigation Satellite Systems (ISGNSS), Istanbul, Turkey, 10/2013. Falletti, E., D. Margaria, M. Nicola, G. Povero, and M. Troglia Gamba, "N-FUELS and SOPRANO: Educational Tools for Simulation, Analysis and Processing of Satellite Navigation Signals", IEEE International Conference on Frontiers in Education (FIE), Oklahoma City, Oklahoma, USA, 10/2013. Dovis, F., O. Julien, B. Deisting, G. Povero, M. Bousquet, and R. Blasi, "G-TRAIN-Supporting Education and Training in the Field of Satellite Navigation in Europe", IEEE Global Engineering Education Conference, EDUCON 2012, Marrakech, Morocco, 04/2012. Deisting, B., F. Dovis, H. Haas, O. Julien, M. Bousquet, and G. Povero, "The European Satellite navigation University Network (SUN)", Toulouse Space Show , 06/2012. Dovis, F., O. Julien, B. Deisting, G. Povero, and M. Bousquet, "The G-TRAIN project: a coordinated framework to prepare GNSS experts in Europe", Toulouse Space Show , Toulouse, France, 06/2012. Margaria, D., E. Falletti, B. Motella, M. Pini, and G. Povero, "N-FUELS, a GNSS Educational Tool for Simulation and Analysis of a Variety of Signals in Space", ENC-GNSS 2010, vol. Proc. of ENC-GNSS 2010, 10/2010. Belforte, G., G. Povero, and M. Vannucchi, "The SEAGAL project", Coordinates, vol. 5, issue 5, pp. 32-33, 05/2010. Povero, G., "The SEAGAL Project Objectives and Activities", First Asia Pacific GNSS Workshop, Bangkok, Thailand, 01/2010. Lo Presti, L., M. Vannucchi, P. Mulassano, and G. Povero, "Traditional and New Educational Initiatives on Satellite Navigation in Torino", The Public Face of Space - 14th Annual International Symposium at International Space University , Strasbourg - France, 02/2010. Phuong, X. Q., G. Povero, and G. Belforte, "Work in Progress - GnssEduPack: an Innovative Approach to Education and Training in the Field of Global Navigation Satellite Systems", FIE 2010 - 40th ASEE IEEE Frontiers in Education Conference, Arlington, TX, USA, pp. 1–2, 10/2010. Povero, G., "SEAGAL: A Centre to Boost Europe-Vietnam Joint Activities in the Field of Satellite Navigation", International Conferences on Advanced Technologies for Communications (ATC2009), Hai Phong, Vietnam, 10/2009. Dovis, F., G. Povero, and M. Vannucchi, "The NAVKIT: A European Multimedia Tool for Professional Training in the Field of Satellite Navigation Technology", IEEE Frontiers in Education , San Antonio, Texas (USA), 10/2009. Dovis, F., A. Lee, L. Lo Presti, and G. Povero, "A Masters programme on navigation and related applications: An academia-industry interaction programme benefiting developing countries", 5th Global Congress on Engineering Education, New York, USA, 07/2006. Dovis, F., A. Lee, L. Lo Presti, and G. Povero, "Master Program on Navigation and related Applications: a partnership between university, private sector, and international bodies", IEEE International COnference on Frontiers in Education (FIE), San Diego, California, USA, 10/2006. Visintin, M., G. Povero, and E. Vassallo, "Bandwidth-Efficient Modulation Schemes for the Space Research Service", 2-nd ESA Workshop on Tracking Telemetry and Command Systems for Space Applicatio, pp. 1–8, 2001. Visintin, M., G. Povero, and E. Vassallo, "Performance of Bandwidth-Efficient Modulation Schemes in the presence of RFI", 19-th AIAA International Communications Satellite Systems Conference and Exhibit, vol. paper \#910, pp. 1–10, 2001.